Courtesy photo Three people were arrested on drug charges at this Leesville Road home Tuesday. CRESTLINE — Three people were arrested and drugs, drug paraphernalia, firearms and cash were confiscated Tuesday, Feb. 5 as the the Crawford County Sheriff’s Office, Metrich and the Crawford County Special Response Team executed a search warrant at 6867 Leesville Road. It was the culmination of a two-month investigation into a drug trafficking complaint. Chad C. Bucklew, born Feb. 26, 1981, on a probation violation. Travis Ratliff, born May 21, 1981, on several felonies, including trafficking in drugs (heroin, in the vicinity of a junvenile), trafficking in drugs (fentanyl, in the vicinity of a juvenile) and possession of drugs (heroin and fentanyl). Misty N. Chatman, born July 16, 1984, on a felony count of possession of drugs (heroin and fentanyl). 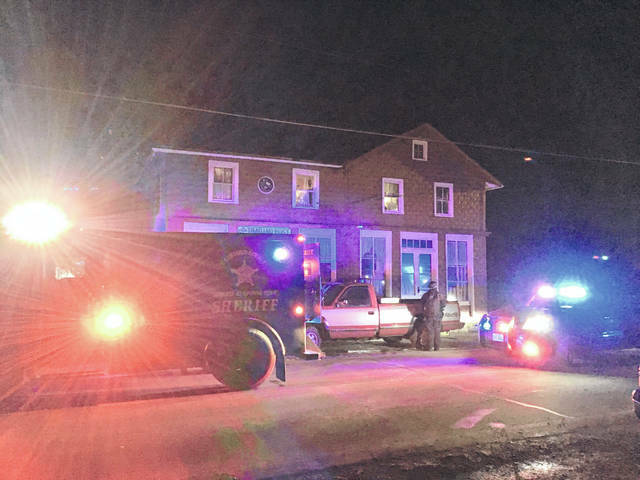 On Thursday, Feb. 7 in Galion, The Crawford County Sheriff’s Office, along with Metrich, Galion Police and the Crawford County Special Response team, served a search warrant at 1409 Baehr Street. According to the sheriff’s office, law enforcement officers confiscated drugs, drug paraphernalia and cash from the house. Edward L. Johnson, 43, and Nichole M. Cooley, 33, was arrested on felony drug counts, including trafficking in drugs and possession of drugs. https://www.galioninquirer.com/wp-content/uploads/sites/38/2019/02/web1_Leesville-Rd-arrest-1-1-1-1.jpgCourtesy photo Three people were arrested on drug charges at this Leesville Road home Tuesday.